From I-25 turn left onto Mariposa Street at the local landmark known as the Lincoln Park Lounge. The block crunched between 8th and 9th avenues is crowded with two-bedroom starter homes that, today, rest in the shadows of something unexpected: Towering, LEED-certified townhomes, constructed with contemporary, natural wood façades and shiny steel, as part of the Denver Housing Authority’s Mariposa Redevelopment. Welcome to the new era of public housing, circa 2017, in a city experiencing its greatest economic expansion in a hundred years. The new residences are handsome, efficient, neighborhood-friendly and designed to ensure everybody benefits from the boom. And they are driven by one basic question: “How do we further expand the pathways for individuals who have yet to benefit from Denver’s growth and prosperity?,” asks Ismael Guerrero, DHA’s executive director. For DHA, the answer has been to rethink what’s possible with low-income developments, and that has been a big job for a sizable government agency. 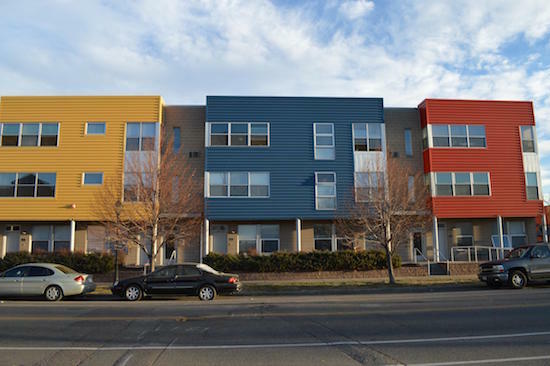 “Denver Housing Authority is the largest provider of affordable housing in this state, through its traditional housing program as well as its housing voucher program,” explains Erik Soliván, executive director of Denver’s new Office of Housing and Opportunities for People Everywhere (HOPE). DHA's mixed-income Blake Street Flats look right at home in the city's warehouse district. Photo by Daniel Tseng. DHA owns and manages 5,500 housing units that are spread all over the city, in the form of mid-rises, row homes and dispersed properties — the latter of which account for over 1,000 DHA units, and could be anything from single-family homes to duplexes. “We have quite a variety of housing to meet different needs and desires,” Guerrero says. His organization services Denver’s lowest-income households, including seniors on fixed-incomes, tenants collecting disability, single-parent families and the underemployed. Most of DHA’s leasees earn less than $12,000 per year, and the organization’s hand-me-down assets aren’t exactly fancy. “We have some of the oldest housing stock in the city,” Guerrero explains. It’s this conundrum – What to do with old housing and low-income tenants? – that informs DHA’s unique approach to public housing. Every resident deserves quality housing. That’s the first thing you need to know about the overarching philosophy guiding DHA. For Guerrero and his colleagues, it’s all about building and managing homes, which are totally distinct from houses. “We really believe that every resident should feel pride in where they live,” Guerrero says. Home, after all, is much more than four walls and a roof to keep the weather out. Home is the place where we feel accepted, comfortable and safe. Benedict Park Place is within walking distance of a light-rail stop and many restaurants and shops in the Central Business District. Photo by Daniel Tseng. As a property manager, DHA does its part to oblige that vision, keeping its buildings and the surrounding grounds clean and intact. In fact, DHA has been a leader in property management for decades, repeatedly raking in high assessment scores from the federal office of Housing and Urban Development. But what does a housing authority do with its really withered units — the ones needing more than fresh paint and a few nails? “We take the most blighted properties and redevelop them, replacing them with new communities,” says Guerrero. DHA found a way to make its redevelopments financially feasible, by turning rundown projects into thriving — and mixed-income — housing communities. The mixed-income label means the developments are a mash-up of rental rates and open to a socio-economically diverse group of tenants. “Silos of low-income housing aren’t creating opportunities for those living there to grow and prosper economically,” Soliván explains. “Each of the 523 Mariposa Redevelopment housing units looks the same inside, with modern finishes and the requisite amenities: microwave and dishwasher, laundry. Many even have affordable high-speed internet, provided by Comcast through its Internet Essentials package, a broadband accessibility program Comcast has been providing to eligible public housing residents since 2015. Rents fall into three categories, based on resdidents' incomes: subsidized, affordable and market rate. For subsidized housing, tenants are required to pay 30 percent of their income in rent. “If you have zero income, you’d pay zero rent — but we require a minimum of $50 in rent a month,” Guerrero says, noting that HUD provides DHA with subsidies. Affordable, or below-market rates. are available for other tenants falling within a certain income level: anywhere from $20,000 to $45,000 annually. In each of the five Mariposa buildings, low-income tenants paying $50 a month live alongside tenants paying the going rate for the neighbborhood, up to $1,700 for three-bedroom apartments. Residents share everything, parking, community rooms, a playground and community garden, and an on-site fitness center, too. The key to drawing a range of tenants is location – (Mariposa is near both the 10th and Osage light rail station and the Santa Fe Arts District) – and “great design,” Soliván adds. “If you have great housing design, you can’t see the difference between a lower income individual and a higher income individual,” he says. DHA's housing is design-forward. Photo by Daniel Tseng. 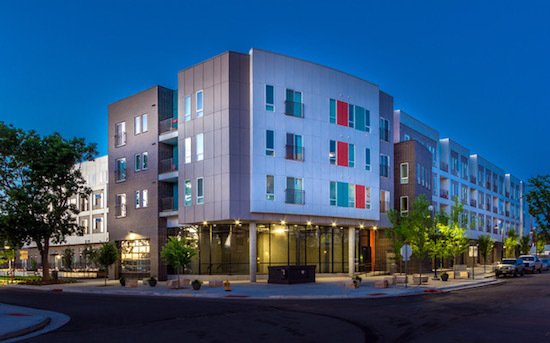 Mariposa taps into mixed-incomes and also mixed-uses, with ground-level retail space for organizations like Catholic Charities, Youth on Record, Osage Café and The Bike Depot, a nonprofit community bike shop, as well as seasonal farmers markets put on by Denver Botanic Gardens. Construction wrapped up earlier this year, in August, and all housing units are currently filled. “That’s one measure of success for us,” Guerrero says, noting that, yes, Mariposa’s residents – students, families, artists and working professionals – do indeed “live happily together” despite their income differences. The idea for mixed-income redevelopments started with the Curtis Park housing development, completed back in 1998. DHA owned about 200 units of public housing in the historic Curtis Park neighborhood. But the facilities had fallen into a state of disrepair in a neighborhood that had a reputation for high crime. “We replaced that original public housing with over 300 units of mixed-income housing,” says Guerrero. The redevelopment wasn’t just a ploy to throw up some new construction in downtown Denver, either. Old subsidized units were replaced one-for-one, and DHA added tax credit and market rate units as an experiment in community living. Today, 135 subsidized units are accompanied by 99 affordable housing units and 94 market rate units. “Since we completed redevelopment, the whole neighborhood has improved. There have been new investments, and property values are up,” Guerrero points out. “It’s not just about the housing. It’s about the neighborhood,” Guerrero continues. “We think the best communities are the ones that are diverse and inclusive,” he adds, noting that mixed-income housing developments stand to be more vibrant and more sustainable. At Mariposa, rents fall into three categories: subsidized, affordable and market rate. Photo from DHA. The Park Avenue/Benedict Park Place Redevelopment in Five Points (completed a few years ago) is another DHA success story, where 250 public housing units were replaced with over 800 units of mixed-income housing. “We also added playgrounds and a dog park and introduced a street grid, reconnecting housing to the Uptown neighborhood, so pedestrians would have a better walking experience,” says Guerrero. For its mixed-income redevelopments, DHA received $25 to $30 million federal dollars per project, through HUD’s “Choice Neighborhoods” program. “They’re very competitive grants,” says Guerrero. And the fact that DHA continually lands them — well, that’s a testament in itself to the organization’s prowess. 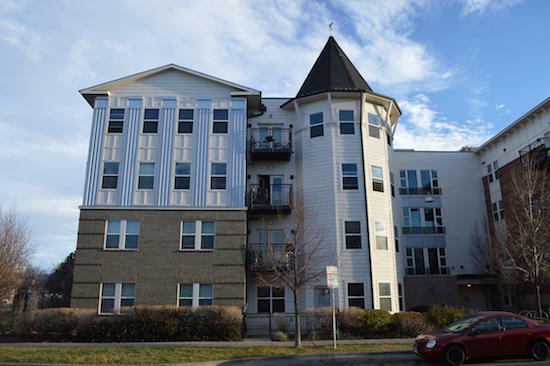 “One of the unique things about DHA is that they have an extremely strong track record of applying for – and receiving – these federal awards,” says Jaime Gomez, deputy executive director of the Colorado Housing and Finance Authority. Since the late 80s, CHFA has supported DHA in building more than 3,000 affordable housing units. “Our relationship with DHA is as an allocating agency,” Gomez clarifies. In Colorado, Gomez explains, the majority of affordable rental housing is built on tax credits. CHFA works with DHA to assign those credits. But CHFA has also been a “key financing partner,” Guerrero says, for DHA’s large-scale “transformation work” — AKA its mixed-income housing redevelopments. 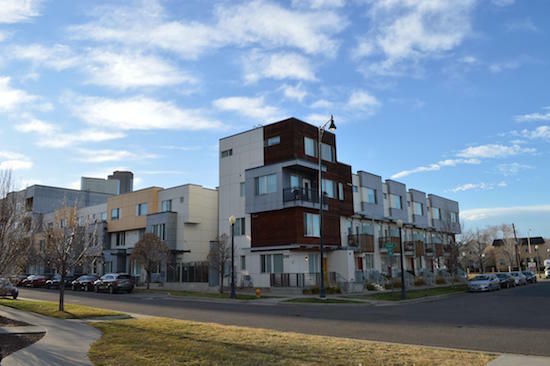 With Mariposa wrapped up, DHA has its sites set, next, on the Sun Valley neighborhood, where it will work with CHFA and the city of Denver to develop a fourth mixed-income community. 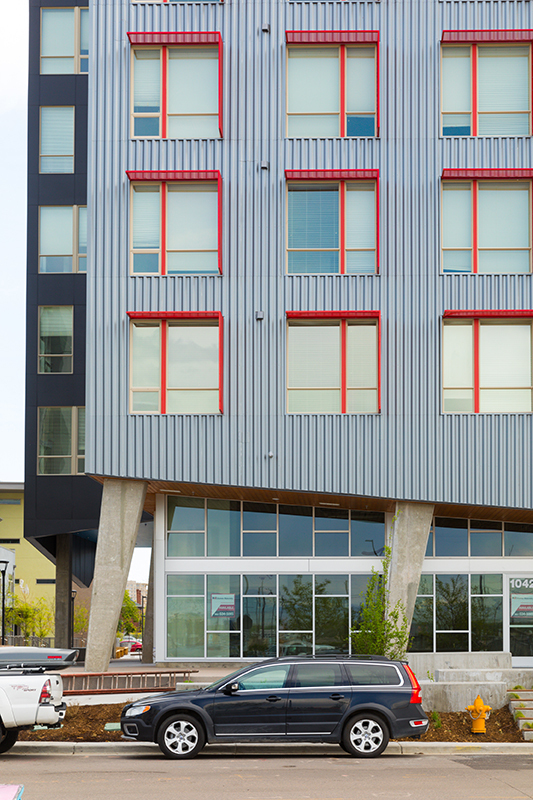 Phase 3 of the Mariposa Redevelopment was designed by Denver's Humphries Poli Architects. Photo from Humphries Poli. A housing authority teaming up with a city agency isn’t all that unexpected. Less predictable is the partnership forged between DHA and Comcast. In addition to wiring public housing through its Internet Essentials program, Comcast also awarded DHA a $100,000 grant to upgrade its technology equipment, both in housing units and at opportunity centers, providing trainings and classes for DHA tenants. “Our relationship with DHA is serving as a model around, not just the state, but the country for how an internet provider can work with the community,” says Mary Spillane, Comcast’s director of community investment. As far as the folks at Comcast are concerned, high-speed internet isn’t very useful if it isn’t accessible (and we’ll be exploring that idea next month, when we continue this series on Denver Housing Authority).